Task force chair asked several times: Could Big Four “swoop in”? An attempt by several Western states to relax their bar ethics rules to make the legal system more affordable could have an unintended effect—allowing Big Four accounting firms to finally gain a foothold in the U.S. legal market. Leaders of task forces in California, Utah, and Arizona say a widespread lack of access to justice for the poor and middle class in civil and family courts spurred them to action. But they note that a move to remedy this problem could lead to a competitive assault on Big Law from the Big Four accounting companies, EY, PwC, Deloitte, and KPMG. If the movement for more access to justice for regular citizens winds up opening a lane for the Big Four to pursue corporate clients in the U.S., Big Law could be in trouble. 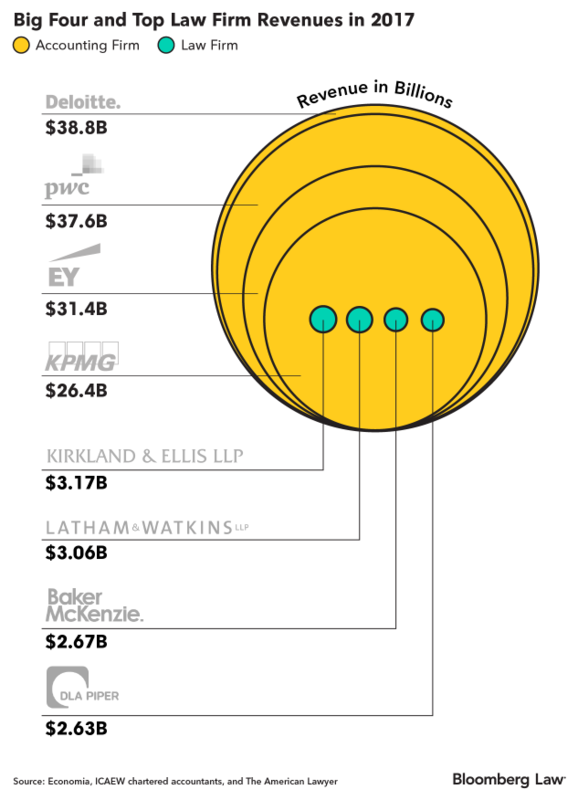 The Big Four’s war chests are exponentially larger than those of even the country’s richest law firms, and their tech capabilities are often greater. The Sarbanes-Oxley Act is an obstacle to the Big Four practicing law in the U.S. The law prohibits audit firms from providing certain non-audit services to their clients. But Big Four officials and legal consultants say changing state bar rules is the key to broadening legal practices in the U.S., not a repeal or revision of Sarbanes-Oxley. If a Big Four firm wanted to open a U.S. law practice after a state bar legal service ownership rule had been softened, they could do so—they’d only need to heed Sarbanes-Oxley by making sure that legal service clients were not also clients of the company’s audit division, said Jim Jones, a senior fellow with Georgetown Law’s Center on Ethics and the Legal Profession. “I always assumed that that’s what they intended,” said Jones. Another option might be to open a new law office as a separate entity, legally distinct from the main Big Four accountancy, he said. Each state bar has adopted versions of 5.4, with only relatively minor exemptions enacted in Washington, D.C., and Washington State. The move to change bar rules to increase access to justice began last year in California. The state bar’s board of trustees asked Indiana University Maurer School of Law professor William Henderson to conduct a landscape analysis of the nation’s legal services market. “The legal profession is at an inflection point that requires action by regulators,” he wrote. The Association of Professional Responsibility Lawyers also began studying the issue early last year. Months after Henderson’s report, State supreme court judges in Arizona and Utah followed California’s lead, ordering that the issue of non-lawyer investment and ownership of legal services companies be reviewed. The three state panels also have been tasked in different cases with looking at separate bar rules regarding the unauthorized practice of law, and the “unbundling” of services to allow for smaller-scale, limited-scope legal representations. Reports are due from the professional responsibility lawyers group and the state task forces later this year. State panels have not yet detailed how changes to state bar rules could disrupt the practice of law by allowing the Big Four in, but task force leaders say the issue has come up informally. “We recognize that if we open up 5.4, there are consequences that are likely to occur,” said Toby Rothschild, one of two vice chairs of the California Task Force on Access Through Innovation of Legal Services. According to Rothschild and fellow task force member Kevin Mohr, the panel recognizes the underlying need to balance the need for access to justice with the long-standing notions that 5.4 is necessary to protect the public, by defending legal professionalism and the ability of lawyers to maintain independence of judgment. That said, the task force may be leaning toward suggesting a more significant loosening of the rules, Mohr said. “We might need to allow for a diminishment of public protection in order to allow for a substantial gain in the access to justice,” he said. If California eliminates 5.4, or even significantly loosens its bar rule, one or more of the Big Four could open a law office there, said Jones. At least initially, they may need to employ lawyers only licensed in that state, he said. If the Western regional state bar trend turns national, and six or more of the largest states follow suit, including New York, Illinois, Texas, and Florida, “then I think you’d see everyone falling in line,” he said. At that point, each of the Big Four would probably open law offices of their own in the U.S., he said. The relationships between the Big Four and Big Law are not always adversarial—firms have enlisted the Big Four for help in areas like technology adoption, and the accountancies have retained law firms for assistance on complex deals. But even with some mutual benefits, the specter of the Big Four, along with alternative legal service providers (ALSPs), is already making some law firms nervous, especially about losing business on more tech-driven legal services like document review and contract creation. One or more jurisdictions will drop or loosen their private investment bar rules within the next five years, spurring a domino effect, predicted Bob Ambrogi, editor of the LawSites blog, in an April 8 column. That in turn “will open the floodgates of competition in legal services. And the EYs and ALSPs of the world will have the upper hand,” he wrote. Larger presence of the Big Four in the states would provide Big Law with a run for its money, as these accountancies invest in emerging tech on a hard-to-match scale and have long provided litigation support services like technical accounting and forensic accounting resources. They’re also adept at sorting through records trails and translating vast amounts of data from receipts, contracts, and other documents into usable information, giving them a competitive advantage over many firms. Despite all this, publicly, anyway, Big Four officials consistently deny any intent to conquer the U.S. legal market. “We don’t have a secret plan to put Big Law out of business. In fact, we don’t have a plan to put you out of business at all,” said Jonathan Nystrom, an EY executive director who leads the company’s antitrust discovery services group, Feb. 28 at the SOLID legal tech conference in San Francisco. “If every state bar said tomorrow, ‘you’re allowed to practice law,’ for the most part we would stay on the same path we’re on,” Nystrom said. On April 4, EY purchased the legal outsourcing business Pangea3 from Thomson Reuters Corp. And last August, it acquired of the U.K.-based Riverview Law, a technology-based firm. Representatives from EY and PwC did not respond to questions by press time. KPMG and Deloitte public affairs officials declined comment.